SYDNEY, May 25 2015 (IPS) - As Papua New Guinea celebrates 40 years of independence, 2015 marks a defining year for the largest Pacific Island nation, set to record 15 percent GDP growth this year. “Even with 14 years of successive double digit growth, the challenge for PNG is to translate high levels of resource revenue into well-being for all citizens. The latest estimate of the population is now over eight million and approximately 36 percent of the people are living on less than 1.25 dollars a day,” United Nations Resident Coordinator in Papua New Guinea Roy Trivedy told IPS. Mineral resources, including copper, gold, oil, nickel, cobalt and liquid natural gas, constitute 70 percent of all PNG exports; and mine and oil production revenues since independence have amounted to 60 billion dollars, according to the Human Development Report 2013. Still, PNG currently ranks 156th out of 187 countries in the United Nations’ Human Development Index (HDI). U.N. agencies have worked across different sectors to support PNG in the development of education and health, poverty reduction, and assistance with disaster risk reduction and social protection. Many of the reforms implemented by the current government over the past three years are beginning to take root. For example, the Tuition Fee Free (TFF) education policy, benefitting students at the elementary and secondary level, is gaining acceptance throughout the country, with two million children currently enrolled in schools. The government is also investing in higher education and vocational and tertiary education. But the country faces the challenges of tackling high student-to-teacher ratios, building and refurbishing educational infrastructure, improving quality of primary education services and scaling up the provision of secondary and tertiary education. The government has also committed to free primary health care for all citizens, but U.N. agencies working in PNG say more needs to be done to reduce the infant mortality rate from the current 75 deaths per 1,000 live births; reduce the number of under-five children dying of preventable diseases; and reduce the maternal mortality rate, which has remained at 733 deaths per 100,000 live births over the past decade. In addition, early childhood health is a major issue, with 48 percent of children aged five or younger suffering from malnutrition. Infrastructure development will also be crucial to realising the benefits of the country’s mineral, energy, agricultural and tourism assets. The government is spending considerable resources to modernise and better equip the police, judiciary and corrective services critical for tackling inequality and discrimination, especially against women. PNG will have an opportunity to demonstrate its commitment to uplifting the lives of its people as the international community moves into a new phase of its development agenda: the post-2015 Sustainable Development Goals (SDGs). Papua New Guinea is the co-facilitator with Denmark of the Global Summit on SDGs scheduled to take place later this year. Following a decade-and-a-half of development guided by the Millennium Development Goals (MDGs), the new global blueprint for poverty eradication is expected to be centred on sustainability, including combating climate change, protecting the environment, preserving biodiversity and conserving oceans, seas and marine resources: issues that are highly relevant for Pacific Island countries threatened by rising sea levels. While the 22 Pacific island countries and territories contribute just 0.03 percent to global emissions, their collective population of 10 million people will likely suffer some of the worst impacts of climate change. In addition to loss of human life as a result of natural disasters, the Asian Development Bank (ADB) estimates that climate change could cost the region over 12 percent of its annual gross domestic product (GDP) by the turn of the century. Against this backdrop, IPS correspondent Neena Bhandari sat down with Papua New Guinea’s Prime Minister Peter O’Neill, to discuss the U.N.’s role in PNG’s development agenda. Excerpts from the interview follow. 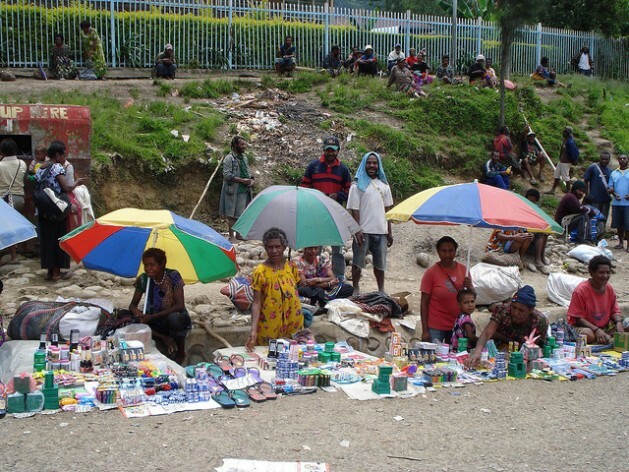 Q: Has the United Nations contributed to Papua New Guinea’s economic development? A: We have many United Nations organisations in Papua New Guinea and I would like to thank them for their contribution to the country’s development agenda. We are very happy with the work that they are doing, especially UNDP [the United Nations Development Programme], which is engaged with our department of planning [Department of National Planning and Monitoring] in setting up various programmes all around the country, including Bougainville. Q: It seems PNG is not ‘on track’ to meet any of the Millennium Development Goals, scoring either ‘off track’ or ‘mixed’ in the latest results surveys. What is being done to fix the problem? A: In fact, we have made significant progress in meeting the Millennium Development Goals. Two or three years ago, we would have completely missed the MDG targets. But right now on issues related to infant mortality and literacy, the progress is much better because of the education and health programmes that we are rolling out. These programmes are contributing significantly to meeting the MDG targets. Q: What are your aspirations for the Sustainable Development Goals? What strategies would you adopt to achieve the SDGs? A: We think that our policies today are starting to yield the positive outcomes that we want: to make sure our literacy rates are beyond 80 to 90 percent; our infant mortality rates drop down to levels that are comparable to our neighbouring countries; and our life expectancy increases. We believe that if we continue to invest in the programmes that we have today, we will achieve those results that the international community has laid down for everybody. Q: The island nation has been the focus of Chinese investment and Australian aid. The Australia-PNG bilateral aid programme is worth approximately 577 million dollars in the current financial year. Which has been more beneficial for the country’s development? A: Both are beneficial. The Chinese investment is not dissimilar to many of the other investments they make around the region. They make similar investments in Australia, similar investments in Indonesia and all throughout the world. But I think in terms of support in social programmes, the more beneficial investment is through the aid programme that the Australian Government continues to provide. Now they are aligning their programmes to our priorities, which has never happened before. The aid programme is now looking towards the education problems that we have, the health, good governance and the law and order problems that we have. Those are the programmes that our government is regularly focusing on and the aid programme is partnering in achieving the outcomes that we want. Q: In Papua New Guinea, there have been positive steps toward integrating West Papuan refugees and also lifting reservations to the 1951 Refugee Convention. What measures are being taken to rehabilitate ‘climate refugees’, for example, people residing on Carteret Islands, who are in danger of being submerged due to the rise in sea levels? A: Climate change is global and it is not something that is unique to PNG, but we are trying to resettle many of those refugees on the mainland. Most of them have families and we are trying to get them integrated into communities that they are comfortable with. As in the case of West Papuan refugees down at Western Province, many of them are already in PNG for many, many years and we are taking steps so they can become citizens and have access to all the services that the government provides for its citizens. Q: Will climate change be a major problem for PNG and other countries in the Pacific? A: Yes, we are facing similar problems like some of the smaller Pacific Island countries. We have thousands of low-lying islands and as the sea level rises, these people will have to continue to move. The first step for developed countries like Australia and the United States should be to sign up to the Kyoto Protocol and then go with the rest of the international community. Climate change is a global issue where we all need to work together in reducing emissions and lowering the global warming challenge that we face.